A temperature is a comparative objective measure of hot and cold. It is measured, typically by a thermometer, through the bulk behavior of a thermometric material, detection of heat radiation, or by particle velocity or kinetic energy. It may be calibrated in any of various temperature scales, Celsius, Fahrenheit, Kelvin, etc. Measurements with a small thermometer, or by detection of heat radiation, can show that the temperature of a body of material can vary from time to time and from place to place within it. If changes happen too fast, or with too small a spacing, within a body, it may be impossible to define its temperature. Thus the concept of temperature in general has an empirical content. When conditions are such that temperatures are defined, they govern the direction of heat transfer between bodies. Within a body that exchanges no energy or matter with its surroundings, temperature tends to become spatially uniform as time passes. When a path permeable only to heat is open between two bodies, energy always transfers spontaneously as heat from a hotter body to a colder one. The transfer rate depends on the nature of the path. If they are connected by a path permeable only to heat, and no heat flows between them, then the two bodies are equally hot. If changes are slow and spatially smooth enough to allow consistent comparisons of their hotness with other bodies that are respectively in their own states of internal thermodynamic equilibrium, they obey the Zeroth law of thermodynamics and then they have well defined and equal temperatures. Then thermodynamics provides a fundamental physical definition of temperature, on an absolute scale, relying on the second law of thermodynamics. The kinetic theory offers a valuable but limited account of the behavior of the materials of macroscopic systems. It indicates the absolute temperature as proportional to the average kinetic energy of the random microscopic motions of their constituent microscopic particles such as electrons, atoms, and molecules. Thermal vibration of a segment of protein alpha helix. The amplitude of the vibrations increases with temperature. The coldest theoretical temperature is called absolute zero. It can be approached but not reached in any actual physical system. It is denoted by 0 K on the Kelvin scale, −273.15 °C on the Celsius scale, and −459.67 °F on the Fahrenheit scale. In matter at absolute zero, the motions of microscopic constituents are minimal. Temperature is important in all fields of natural science, including physics, geology, chemistry, atmospheric sciences and biology. 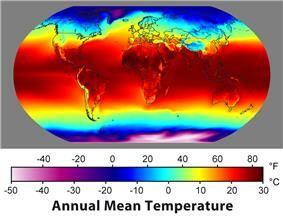 The Celsius scale (°C) is used for common temperature measurements in most of the world. It is an empirical scale. It developed by a historical progress, which led to its zero point 0°C being defined by the freezing point of water, with additional degrees defined so that 100°C was the boiling point of water, both at sea-level atmospheric pressure. Because of the 100 degree interval, it is called a centigrade scale. Since the standardization of the kelvin in the International System of Units, it has subsequently been redefined in terms of the equivalent fixing points on the Kelvin scale, and so that a temperature increment of one degree Celsius is the same as an increment of one kelvin, though they differ by an additive offset of 273.15. The United States commonly uses the Fahrenheit scale, on which water freezes at 32 °F and boils at 212 °F at sea-level atmospheric pressure. Many scientific measurements use the kelvin temperature scale (unit symbol K), named in honor of the Scottish physicist who first defined it. It is a thermodynamic or absolute temperature scale. Its zero point, 0K, is defined to coincide with coldest physically-possible temperature (called absolute zero). Its degrees are defined through thermodynamics. The temperature of absolute zero occurs at 0K = -273.15°C (or −459.67 °F), and the freezing point of water at sea-level atmospheric pressure occurs at 273.15K = 0°C. The International System of Units (SI) defines a scale and unit for the kelvin or thermodynamic temperature by using the reliably reproducible temperature of the triple point of water as a second reference point (the first reference point being 0 K at absolute zero). The triple point is a singular state with its own unique and invariant temperature and pressure, along with, for a fixed mass of water in a vessel of fixed volume, an autonomically and stably self-determining partition into three mutually contacting phases, vapour, liquid, and solid, dynamically depending only on the total internal energy of the mass of water. For historical reasons, the triple point temperature of water is fixed at 273.16 units of the measurement increment. Theoretically based temperature scales are based directly on theoretical arguments, especially those of thermodynamics, of kinetic theory, and of quantum mechanics. They rely on theoretical properties of idealized devices and materials. They are more or less comparable with practically feasible physical devices and materials. Theoretically based temperature scales are used to provide calibrating standards for practical empirically based thermometers. An ideal material on which a temperature scale can be based is the ideal gas. The pressure exerted by a fixed volume and mass of an ideal gas is directly proportional to its temperature. Some natural gases show so nearly ideal properties over suitable temperature ranges that they can be used for thermometry; this was important during the development of thermodynamics, and is still of practical importance today. The ideal gas thermometer is, however, not theoretically perfect for thermodynamics. This is because the entropy of an ideal gas at its absolute zero of temperature is not a positive semi-definite quantity, which puts the gas in violation of the third law of thermodynamics. The physical reason is that the ideal gas law, exactly read, refers to the limit of infinitely high temperature and zero pressure. Measurement of the spectrum of electromagnetic radiation from an ideal three-dimensional black body can provide an accurate temperature measurement because the frequency of maximum spectral radiance of black-body radiation is directly proportional to the temperature of the black body; this is known as Wien's displacement law, and has a theoretical explanation in Planck's law and the Bose–Einstein law. Measurement of the spectrum of noise-power produced by an electrical resistor can also provide an accurate temperature measurement. The resistor has two terminals and is in effect a one-dimensional body. The Bose-Einstein law for this case indicates that the noise-power is directly proportional to the temperature of the resistor and to the value of its resistance and to the noise band-width. In a given frequency band, the noise-power has equal contributions from every frequency, and is called Johnson noise. If the value of the resistance is known then the temperature can be found. The Kelvin scale is called absolute for two reasons. One is Kelvin's, that its formal character is independent of the properties of particular materials. The other reason is that its zero is in a sense absolute, in that it indicates absence of microscopic classical motion of the constituent particles of matter, so that they have a limiting specific heat of zero for zero temperature, according to the third law of thermodynamics. Nevertheless, a Kelvin temperature has a definite numerical value, that has been arbitrarily chosen by tradition. This numerical value also depends on the properties of water, which has a gas–liquid–solid triple point that can be reliably reproduced as a standard experimental phenomenon. The choice of this triple point is also arbitrary and by convention. The Kelvin scale is also called the thermodynamic scale. Kelvin's original work postulating absolute temperature was published in 1848. It was based on the work of Carnot, before the formulation of the first law of thermodynamics. Kelvin wrote in his 1848 paper that his scale was absolute in the sense that it was defined "independently of the properties of any particular kind of matter." His definitive publication, which sets out the definition just stated, was printed in 1853, a paper read in 1851. This definition rests on the physical assumption that there are readily available walls permeable only to heat. In his detailed definition of a wall permeable only to heat, Carathéodory includes several ideas. The non-deformation state variable of a closed system is represented as a real number. A state of thermal equilibrium between two closed systems connected by a wall permeable only to heat means that a certain mathematical relation holds between the state variables, including the respective non-deformation variables, of those two systems (that particular mathematical relation is regarded by Buchdahl as a preferred statement of the zeroth law of thermodynamics). Also, referring to thermal contact equilibrium, "whenever each of the systems S1 and S2 is made to reach equilibrium with a third system S3 under identical conditions, the systems S1 and S2 are in mutual equilibrium." It may viewed as a re-statement of the principle stated by Maxwell in the words: "All heat is of the same kind." This physical idea is also expressed by Bailyn as a possible version of the zeroth law of thermodynamics: "All diathermal walls are equivalent." Thus the present definition of thermodynamic temperature rests on the zeroth law of thermodynamics. Explicitly, this present definition of thermodynamic temperature also rests on the first law of thermodynamics, for the determination of amounts of energy transferred as heat. Temperature is a measure of a quality of a state of a material  The quality may be regarded as a more abstract entity than any particular temperature scale that measures it, and is called hotness by some writers. The quality of hotness refers to the state of material only in a particular locality, and in general, apart from bodies held in a steady state of thermodynamic equilibrium, hotness varies from place to place. It is not necessarily the case that a material in a particular place is in a state that is steady and nearly homogeneous enough to allow it to have a well-defined hotness or temperature. Hotness may be represented abstractly as a one-dimensional manifold. Every valid temperature scale has its own one-to-one map into the hotness manifold. When an energy transfer to or from a body is only as heat, state of the body changes. Depending on the surroundings and the walls separating them from the body, various changes are possible in the body. They include chemical reactions, increase of pressure, increase of temperature, and phase change. For each kind of change under specified conditions, the heat capacity is the ratio of the quantity of heat transferred to the magnitude of the change. For example, if the change is an increase in temperature at constant volume, with no phase change and no chemical change, then the temperature of the body rises and its pressure increases. The quantity of heat transferred, ΔQ, divided by the observed temperature change, ΔT, is the body's heat capacity at constant volume, CV. If heat capacity is measured for a well defined amount of substance, the specific heat is the measure of the heat required to increase the temperature of such a unit quantity by one unit of temperature. For example, to raise the temperature of water by one kelvin (equal to one degree Celsius) requires 4186 joules per kilogram (J/kg)..
A typical Celsius thermometer measures a winter day temperature of -17°C. Temperature is measured with thermometers that may be calibrated to a variety of temperature scales. In most of the world (except for Belize, Myanmar, Liberia and the United States), the Celsius scale is used for most temperature measuring purposes. Most scientists measure temperature using the Celsius scale and thermodynamic temperature using the Kelvin scale, which is the Celsius scale offset so that its null point is 0K = −273.15°C, or absolute zero. Many engineering fields in the U.S., notably high-tech and US federal specifications (civil and military), also use the Kelvin and Celsius scales. Other engineering fields in the U.S. also rely upon the Rankine scale (a shifted Fahrenheit scale) when working in thermodynamic-related disciplines such as combustion. For everyday applications, it is often convenient to use the Celsius scale, in which 0°C corresponds very closely to the freezing point of water and 100°C is its boiling point at sea level. Because liquid droplets commonly exist in clouds at sub-zero temperatures, 0°C is better defined as the melting point of ice. In this scale a temperature difference of 1 degree Celsius is the same as a 1kelvin increment, but the scale is offset by the temperature at which ice melts (273.15 K). The field of plasma physics deals with phenomena of electromagnetic nature that involve very high temperatures. It is customary to express temperature as energy in units of electronvolts (eV) or kiloelectronvolts (keV). The energy, which has a different dimension from temperature, is then calculated as the product of the Boltzmann constant and temperature, E = k_B T. Then, 1 eV corresponds to 11605K. In the study of QCD matter one routinely encounters temperatures of the order of a few hundred MeV, equivalent to about 1012K. In the context of thermodynamics, the kinetic energy is also referred to as thermal energy. The thermal energy may be partitioned into independent components attributed to the degrees of freedom of the particles or to the modes of oscillators in a thermodynamic system. In general, the number of these degrees of freedom that are available for the equipartitioning of energy depend on the temperature, i.e. the energy region of the interactions under consideration. For solids, the thermal energy is associated primarily with the vibrations of its atoms or molecules about their equilibrium position. In an ideal monatomic gas, the kinetic energy is found exclusively in the purely translational motions of the particles. In other systems, vibrational and rotational motions also contribute degrees of freedom. 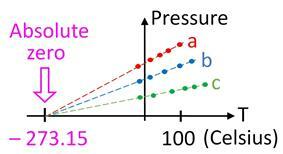 Plots of pressure vs temperature for three different gas samples extrapolated to absolute zero. where n is the number of moles of gas and R = 8.314472(15) J mol−1K−1 is the gas constant. This relationship gives us our first hint that there is an absolute zero on the temperature scale, because it only holds if the temperature is measured on an absolute scale such as Kelvins. The ideal gas law allows one to measure temperature on this absolute scale using the gas thermometer. The temperature in kelvins can be defined as the pressure in pascals of one mole of gas in a container of one cubic meter, divided by the gas constant. Although it is not a particularly convenient device, the gas thermometer provides an essential theoretical basis by which all thermometers can be calibrated. 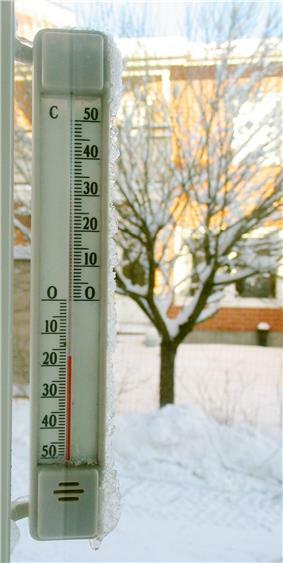 As a practical matter it is not possible to use a gas thermometer to measure absolute zero temperature since the gases tend to condense into a liquid long before the temperature reaches zero. It is possible, however, to extrapolate to absolute zero by using the ideal gas law, as shown in the figure. where the Boltzmann constant, k, is the ideal gas constant divided by the Avogadro number, and vrms is the root-mean-square speed. Thus the ideal gas law states that internal energy is directly proportional to temperature. This direct proportionality between temperature and internal energy is a special case of the equipartition theorem, and holds only in the classical limit of an ideal gas. It does not hold for most substances, although it is true that temperature is a monotonic (non-decreasing) function of internal energy. When two otherwise isolated bodies are connected together by a rigid physical path impermeable to matter, there is spontaneous transfer of energy as heat from the hotter to the colder of them. Eventually they reach a state of mutual thermal equilibrium, in which heat transfer has ceased, and the bodies' respective state variables have settled to become unchanging. This statement helps to define temperature but it does not, by itself, complete the definition. An empirical temperature is a numerical scale for the hotness of a thermodynamic system. Such hotness may be defined as existing on a one-dimensional manifold, stretching between hot and cold. Sometimes the zeroth law is stated to include the existence of a unique universal hotness manifold, and of numerical scales on it, so as to provide a complete definition of empirical temperature. To be suitable for empirical thermometry, a material must have a monontonic relation between hotness and some easily measured state variable, such as pressure or volume, when all other relevant coordinates are fixed. An exceptionally suitable system is the ideal gas, which can provide a temperature scale that matches the absolute Kelvin scale. The Kelvin scale is defined on the basis of the second law of thermodynamics. In the previous section certain properties of temperature were expressed by the zeroth law of thermodynamics. It is also possible to define temperature in terms of the second law of thermodynamics which deals with entropy. Entropy is often thought of as a measure of the disorder in a system. The second law states that any process will result in either no change or a net increase in the entropy of the universe. This can be understood in terms of probability. For example, in a series of coin tosses, a perfectly ordered system would be one in which either every toss comes up heads or every toss comes up tails. This means that for a perfectly ordered set of coin tosses, there is only one set of toss outcomes possible: the set in which 100% of tosses come up the same. On the other hand, there are multiple combinations that can result in disordered or mixed systems, where some fraction are heads and the rest tails. A disordered system can be 90% heads and 10% tails, or it could be 98% heads and 2% tails, et cetera. As the number of coin tosses increases, the number of possible combinations corresponding to imperfectly ordered systems increases. For a very large number of coin tosses, the combinations to ~50% heads and ~50% tails dominates and obtaining an outcome significantly different from 50/50 becomes extremely unlikely. Thus the system naturally progresses to a state of maximum disorder or entropy. where EF is the Fermi energy which tends to the ordinary temperature when N goes to infinity. On the empirical temperature scales, which are not referenced to absolute zero, a negative temperature is one below the zero-point of the scale used. For example, dry ice has a sublimation temperature of −78.5°C which is equivalent to −109.3°F. On the absolute Kelvin scale, however, this temperature is 194.6 K. On the absolute scale of thermodynamic temperature no material can exhibit a temperature smaller than or equal to 0 K, both of which are forbidden by the third law of thermodynamics. C For a true black-body (which tungsten filaments are not). Tungsten filaments' emissivity is greater at shorter wavelengths, which makes them appear whiter. E The 273.15 K difference between K and °C is without the precision of these values. F For a true black-body (which the plasma was not). The Z machine's dominant emission originated from 40 MK electrons (soft x–ray emissions) within the plasma. ^ a b c Truesdell, C.A. (1980), Sections 11 B, 11H, pages 306–310, 320-332. ^ Tschoegl, N.W. (2000), p.88. ^ Buchdahl, H.A (1986). On the redundancy of the zeroth law of thermodynamics, J. Phys. A, Math. Gen., 19: L561–L564. ^ A partly reliable translation is to be found at Kestin, J. (1976). The Second Law of Thermodynamics, Dowden, Hutchinson & Ross, Stroudsburg PA.
^ Bailyn, M. (1994). A Survey of Thermodynamics, American Institute of Physics Press, New York, ISBN 0-88318-797-3, page 24. ^ Quinn, T.J. (1983). Temperature, Academic Press, London, ISBN0-12-569680-9, pp. 160–162. ^ Tisza, L. (1966). Generalized Thermodynamics, M.I.T. Press, Cambridge MA, pp. 47,57. ^ a b Callen, H.B. (1960/1985), Thermodynamics and an Introduction to Thermostatistics, (first edition 1960), second edition 1985, John Wiley & Sons, New York, ISBN 0–471–86256–8, pp. 146–148. ^ Milne, E.A. (1929). The effect of collisions on monochromatic radiative equilibrium, : 493–50288, Monthly Notices of the Royal Astronomical Society. ^ Callen, H.B. (1960/1985), Thermodynamics and an Introduction to Thermostatistics, (first edition 1960), second edition 1985, John Wiley & Sons, New York, ISBN 0–471–86256–8, pp. 309–310. ^ Bryan, G.H. (1907). Thermodynamics. An Introductory Treatise dealing mainly with First Principles and their Direct Applications, B.G. Teubner, Leipzig, page 3. ^ a b c d Mach, E. (1900). Die Principien der Wärmelehre. Historisch-kritisch entwickelt, Johann Ambrosius Barth, Leipzig, section 22, pages 56-57. ^ a b Serrin, J. (1986). Chapter 1, 'An Outline of Thermodynamical Structure', pages 3-32, especially page 6, in New Perspectives in Thermodynamics, edited by J. Serrin, Springer, Berlin, ISBN 3-540-15931-2. ^ Maxwell, J.C. (1872). Theory of Heat, third edition, Longmans, Green, London, page 32. ^ Tait, P.G. (1884). Heat, Macmillan, London, Chapter VII, pages 39-40. ^ Planck, M. (1897/1903). Treatise on Thermodynamics, translated by A. Ogg, Longmans, Green, London, pages 1-2. ^ Planck, M. (1914), The Theory of Heat Radiation, second edition, translated into English by M. Masius, Blakiston's Son & Co., Philadelphia, reprinted by Kessinger. ^ J. S. Dugdale (1996, 1998). Entropy and its Physical Interpretation. Taylor & Francis. p. 13. ^ M. J. Moran, H. N. Shapiro (2006). "1.6.1". Fundamentals of Engineering Thermodynamics (5 ed.). John Wiley & Sons, Ltd. p. 14. ^ T.W. Leland, Jr. "Basic Principles of Classical and Statistical Thermodynamics". p. 14. Consequently we identify temperature as a driving force which causes something called heat to be transferred. ^ Tait, P.G. (1884). Heat, Macmillan, London, Chapter VII, pages 42, 103-117. ^ Beattie, J.A., Oppenheim, I. (1979). Principles of Thermodynamics, Elsevier Scientific Publishing Company, Amsterdam, 0–444–41806–7, page 29. ^ Landsberg, P.T. (1961). Thermodynamics with Quantum Statistical Illustrations, Interscience Publishers, New York, page 17. ^ Thomsen, J.S. (1962). "A restatement of the zeroth law of thermodynamics". Am. J. Phys. 30: 294–296. ^ Maxwell, J.C. (1872). Theory of Heat, third edition, Longman's, Green & Co, London, page 45. ^ a b Pitteri, M. (1984). On the axiomatic foundations of temperature, Appendix G6 on pages 522-544 of Rational Thermodynamics, C. Truesdell, second edition, Springer, New York, ISBN 0-387-90874-9. ^ Truesdell, C., Bharatha, S. (1977). The Concepts and Logic of Classical Thermodynamics as a Theory of Heat Engines, Rigorously Constructed upon the Foundation Laid by S. Carnot and F. Reech, Springer, New York, ISBN 0-387-07971-8, page 20. ^ a b Serrin, J. (1978). The concepts of thermodynamics, in Contemporary Developments in Continuum Mechanics and Partial Differential Equations. Proceedings of the International Symposium on Continuum Mechanics and Partial Differential Equations, Rio de Janeiro, August 1977, edited by G.M. de La Penha, L.A.J. Medeiros, North-Holland, Amsterdam, ISBN 0-444-85166-6, pages 411-451. ^ Kondepudi, D. (2008). Introduction to Modern Thermodynamics, Wiley, Chichester, ISBN 978-0-470-01598-8, Section 32., pages 106-108. ^ "Absolute Zero". Calphad.com. Retrieved 2010-09-16. ^ C. Caratheodory (1909). "Untersuchungen über die Grundlagen der Thermodynamik". Mathematische Annalen 67 (3): 355–386. ^ Swendsen, Robert (March 2006). "Statistical mechanics of colloids and Boltzmann's definition of entropy". American Journal of Physucs 74 (3): 187–190. ^ Kondepudi, D.K. (1987). "Microscopic aspects implied by the second law". Foundations of Physics 17: 713–722. ^ Feynman, R.P., Leighton, R.B., Sands, M. (1963). The Feynman Lectures on Physics, Addison–Wesley, Reading MA, volume 1, pages 39–6 to 39–12. ^ "World record in low temperatures". Retrieved 2009-05-05. ^ A temperature of 450 ±80 pK in a Bose–Einstein condensate (BEC) of sodium atoms was achieved in 2003 by researchers at MIT. Citation: Cooling Bose–Einstein Condensates Below 500 Picokelvin, A. E. Leanhardt et al., Science 301, 12 Sept. 2003, p. 1515. It's noteworthy that this record's peak emittance black-body wavelength of 6,400 kilometers is roughly the radius of Earth. ^ Measurement was made in 2002 and has an uncertainty of ±3 kelvin. A 1989 measurement produced a value of 5,777.0±2.5 K. Citation: Overview of the Sun (Chapter 1 lecture notes on Solar Physics by Division of Theoretical Physics, Dept. of Physical Sciences, University of Helsinki). ^ The 350 MK value is the maximum peak fusion fuel temperature in a thermonuclear weapon of the Teller–Ulam configuration (commonly known as a hydrogen bomb). Peak temperatures in Gadget-style fission bomb cores (commonly known as an atomic bomb) are in the range of 50 to 100 MK. Citation: Nuclear Weapons Frequently Asked Questions, 3.2.5 Matter At High Temperatures. Link to relevant Web page. All referenced data was compiled from publicly available sources. ^ Peak temperature for a bulk quantity of matter was achieved by a pulsed-power machine used in fusion physics experiments. The term bulk quantity draws a distinction from collisions in particle accelerators wherein high temperature applies only to the debris from two subatomic particles or nuclei at any given instant. The >2 GK temperature was achieved over a period of about ten nanoseconds during shot Z1137. In fact, the iron and manganese ions in the plasma averaged 3.58±0.41 GK (309±35 keV) for 3 ns (ns 112 through 115). Ion Viscous Heating in a Magnetohydrodynamically Unstable Z Pinch at Over 2×109 Kelvin, M. G. Haines et al., Physical Review Letters 96 (2006) 075003. Link to Sandia's news release. ^ Core temperature of a high–mass (>8–11 solar masses) star after it leaves the main sequence on the Hertzsprung–Russell diagram and begins the alpha process (which lasts one day) of fusing silicon–28 into heavier elements in the following steps: sulfur–32 → argon–36 → calcium–40 → titanium–44 → chromium–48 → iron–52 → nickel–56. Within minutes of finishing the sequence, the star explodes as a Type II supernova. Citation: Stellar Evolution: The Life and Death of Our Luminous Neighbors (by Arthur Holland and Mark Williams of the University of Michigan). Link to Web site. More informative links can be found here , and here , and a concise treatise on stars by NASA is here . ^ Based on a computer model that predicted a peak internal temperature of 30 MeV (350 GK) during the merger of a binary neutron star system (which produces a gamma–ray burst). The neutron stars in the model were 1.2 and 1.6 solar masses respectively, were roughly 20 km in diameter, and were orbiting around their barycenter (common center of mass) at about 390 Hz during the last several milliseconds before they completely merged. The 350 GK portion was a small volume located at the pair's developing common core and varied from roughly 1 to 7 km across over a time span of around 5 ms. Imagine two city-sized objects of unimaginable density orbiting each other at the same frequency as the G4 musical note (the 28th white key on a piano). It's also noteworthy that at 350 GK, the average neutron has a vibrational speed of 30% the speed of light and a relativistic mass (m) 5% greater than its rest mass (m0). Torus Formation in Neutron Star Mergers and Well-Localized Short Gamma-Ray Bursts, R. Oechslin et al. of Max Planck Institute for Astrophysics., arXiv:astro-ph/0507099 v2, 22 Feb. 2006. An html summary. ^ How do physicists study particles? by CERN. ^ The Planck frequency equals 1.85487(14)×1043 Hz (which is the reciprocal of one Planck time). Photons at the Planck frequency have a wavelength of one Planck length. The Planck temperature of 1.41679(11)×1032 K equates to a calculated b /T = λmax wavelength of 2.04531(16)×10−26 nm. However, the actual peak emittance wavelength quantizes to the Planck length of 1.61624(12)×10−26 nm.